Australia’s Great Ocean Road is among the world’s best scenic coastal drives. 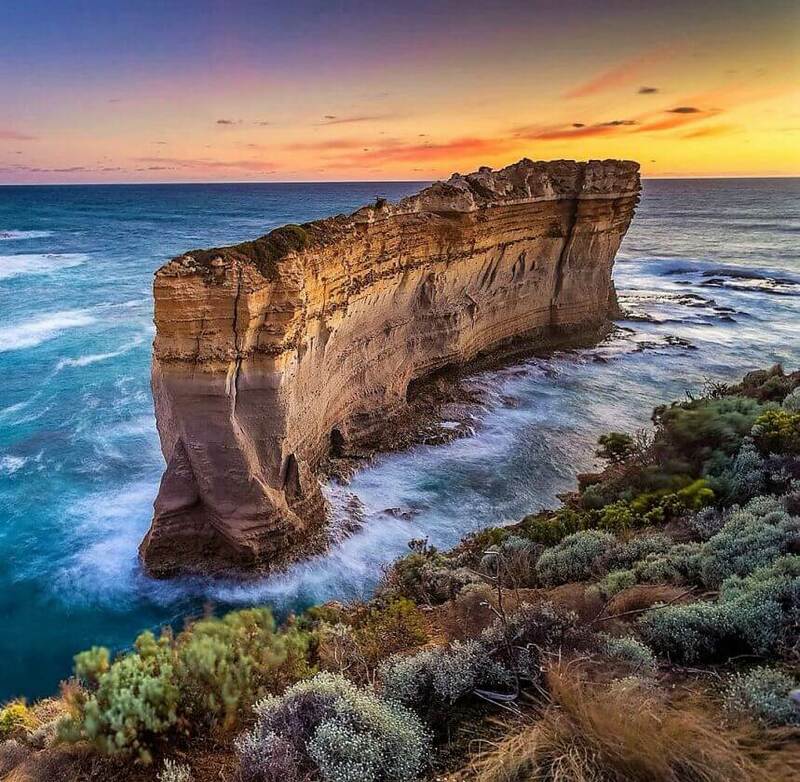 Located 275 km (171 mi) West of Melbourne, the 12 Apostles is the most renowned attraction, best featured at sunset and indeed the highlight of the journey. The 12 Apostles are actually a collection of limestone stacks that have been eroded over the centuries by the waves and stand proud by themselves above the sea. The drive to get to there takes approximately 4.5 hours by car if you take the scenic route along the coast. Shown above is one of the attractions very near to the 12 Apostles – The Razorback. It’s easy to see how it got its name! The limestone formation has a warm glow to it as the last sun rays bounce off it. Pictured against the natural vegetation of the coast, this is a postcard-perfect snap! The 12 Apostles is a must-see for most tourists coming to Melbourne, and is especially popular among couples and families. Bonus tip: stop by the Koala Cafe at Kennett River if you missed the traditional pit-stop at the city of Lorne. The chicken schnitzel burger is one of my favorites, as is the much-needed coffee for the remaining drive to the 12 Apostles. You can also catch the koalas and parrots there in the wild if you’re lucky! 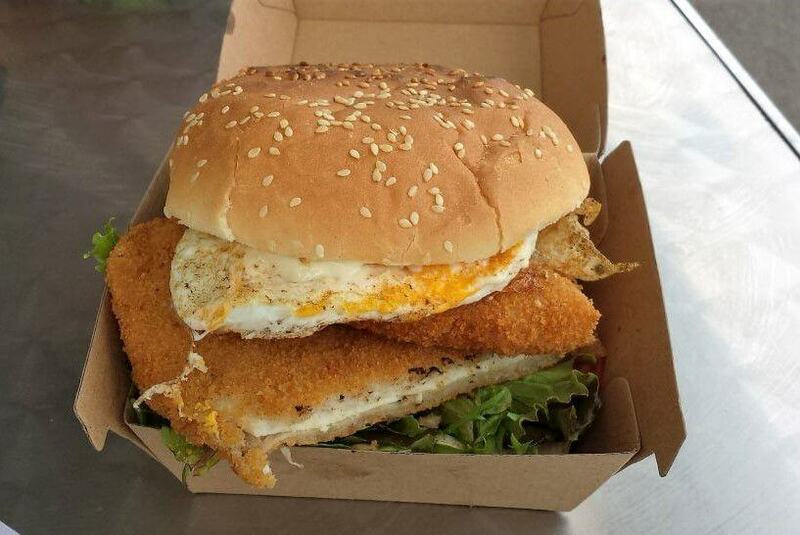 Yums – Chicken Schnitzel burger from the Koala Cafe! Should you be in Melbourne and wish to visit the Great Ocean Road, note that the roads are especially winding and speed limits of 40km/h (25 mph) are not uncommon. Also, bear in mind that sunset varies throughout the year (according to the seasons), and can range from 5.10pm in winter to 7.50pm in summer. Aim to reach at least 1/2 hour before sunset to avoid disappointment. The coastal gusts can also be especially strong since it is directly facing the Antarctic Ocean, so keep your hats, jackets and other gear tightly secured! As driving at night can be a tad tricky given the undulating terrain, it is advisable to stop over for a night to recharge and head back to the city early next morning instead. The nearest town you can head to is Port Campbell, located a mere 12 km (7.5 mi) away from the 12 Apostles – roughly a 15 minutes drive. A good backpackers place is the Port Campbell hostel, which I’ve stayed at and wholeheartedly recommend. The hostel has a full kitchen, private shower cubicles, and yes, free WiFi (we all know the Instagram-worthy sunset shot at 12 Apostles has to go up). Port Campbell is a small town and pubs, eateries and other night entertainment is a short walk away. And if you’re hungry, drop by 12 Rocks Cafe & Beach Bar for a sumptuous seafood dinner and have a nice cold beer to reward yourself after a long day’s drive!